Manifesting themselves in a variety of media, Ryoko Aoki's works are fundamentally based in drawing. Using feathery pencil strokes, stippled felt pen marks, and sure-handed contour drawings, Aoki sketches a morphing world outside of everyday reality. Entire landscapes exist at the same scale as individual details, figures morph into objects, and disparate elements exist in perfect harmony. Her animated video on view will present these drawings of fluid associations in motion. Delicate and hand-crafted, Aoki's works present a contemporary Japanese aesthetic. 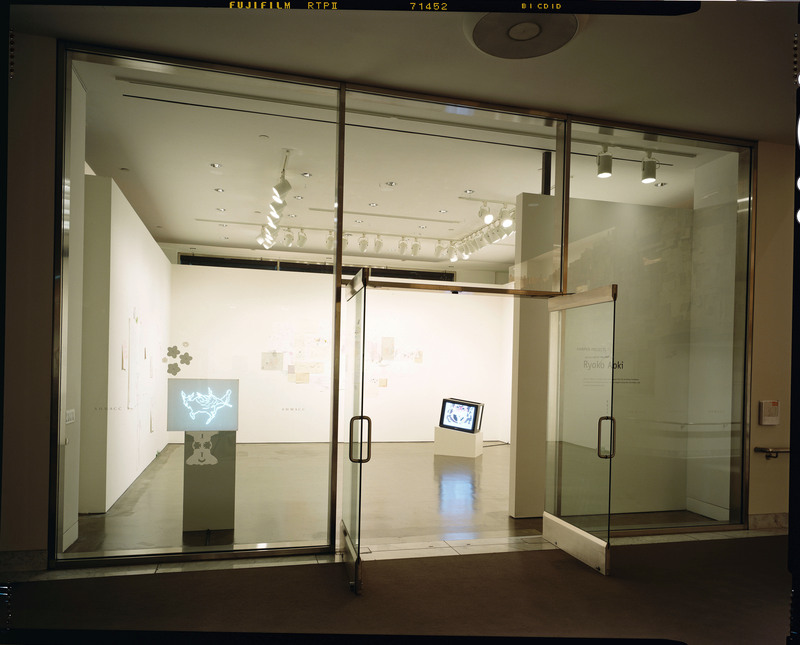 Ryoko Aoki was curated by Aimee Chang, assistant curator at the Hammer Museum. Ryoko Aoki was born in 1973 in Hyogo Prefecture, Japan, and currently lives in Kyoto. She received her MA from the Kyoto University of Fine Art in 1999. Recent group exhibitions include Mirage on a Summer Day at the Gunma Museum of Art, Tatebayashi, Gunma, Japan; I Still Believe in Miracles at the Musee d'art moderne de la ville de Paris; Past in Reverse at the San Diego Museum of Art; and AniMate at the Fukuoka Asian Art Museum, Fukuoka, Japan. Aoki has also had solo exhibitions at Kodama Gallery, Osaka; Marc Foxx Gallery, Los Angeles; and Art Tower Mito, Mito, Japan. Articles on her work have appeared in Artforum and Flash Art an in the recent book Drop Dead Cute. Ryoko Aoki's art is true to the basic impulse behind drawing as a means of recording the processes of perception, but it also captures the workings of the unconscious involved in dream formation. Incorporating disparate images from different sources, her drawings create a visual field in which the relations among images provide as powerful a thrill as their symbolic content. While the frequent appearance of flowers, small animals, and adolescent girls reflects an innocent longing for a pastoral world, the condensation, displacement, and other "rhetorical" paths through which images connect with one another reveal the mind as a receptacle and a mechanism for mixing external stimuli with internal fancies. Aoki's 2001 exhibition Hanayashiki (Flower Mansion) demonstrated her breakthrough in presenting dream formations. Many drawings were deliberately left unfinished, while motifs were repeated from one piece to another, as if the same story were being retold with variations. When such narrative fragments are put into a single field, they create, for one viewer, a fecund rebus with hallucinatory effects and, for another, a maplike layout of narrative shorthand. The drawing Pippi's Story, demonstrates the process of condensation. Disparate images are consecutively accumulated, without perspective or causality: a gigantic head of a carnation and figures of girls in boys' school uniforms occupy the bottom center and are topped by such images as a pond with the disproportionately small figure of a fisherman, poppies larger than people, and girls dancing with a raised fist around a conveyor belt carrying sushi, a psychic moving rocks by telekinesis, and a castle by a mountain. The spectator's eye is guided from bottom to top, from the center to the periphery of the picture field, and back. The density of the picture indicates the simultaneous unfolding of several plots, while the succession of heterogeneous images recapitulates the sense of moving from one dream sequence to another with no awareness of any discrepancy. Crappy Sight, another drawing from Hanayashiki, represents the process of displacement. Elliptically drawn images of mountains, trees, and ponds, vertically placed, connect with one another through analogical displacement. The outlines of mountains are echoed by trees, whose branches can be read as roots and paths; from a clearing that may be a pond, a cartoonish sign of a clash grows, producing stars, which tumble down from the heavens, creating rain that nurtures flowers. Evoking an animated film, the drawing also resembles a primitive wall painting in its metonymical indication of a larger context through simple figures contiguously arranged in a limited space. The images are linked here by a sort of "primitive" mind that does not distinguish between the real and the imaginary, treating them as equally important elements that can be blended to constitute a new reality. 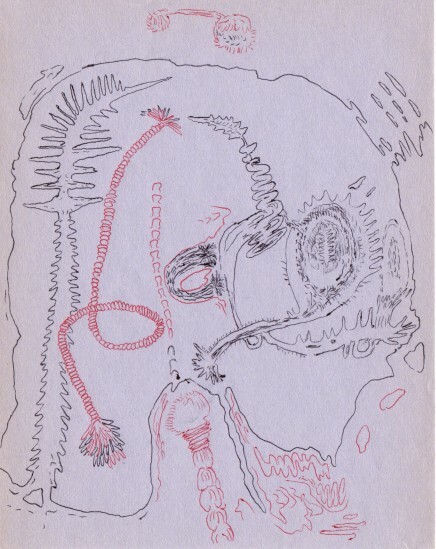 It evokes the art of the Australian Aborigines, who, as Gilles Deleuze has noted, "link nomadic itineraries to dream voyages, which together compose 'an interstitching of routes' in an immense cut-out (découpe) of space and time that must be read like a map." Deleuze affirms that "the imaginary and the real [are]...two juxtaposable or superimposable parts of a single trajectory: two faces that ceaselessly interchange with one another, a mobile mirror. "3 The unconscious is thus to be thought of not as an archive for memory, but as a vehicle for the "mobilization" of images. 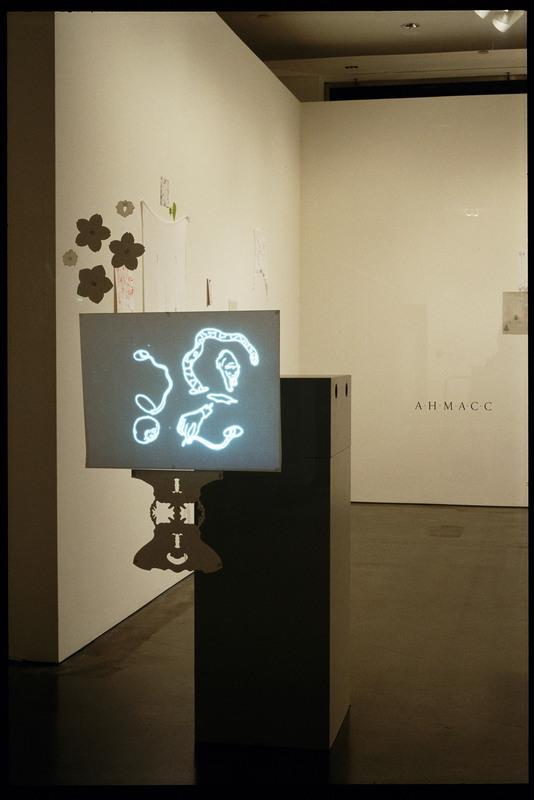 Aoki explored the interplay of the imaginary and the real in the 2002 exhibition Gluesight. In these drawings intricately rendered landscapes are frequently placed within a loop of a rope. In Valley, for example, above a field with a grazing cow, two diagonal lines are drawn from the margins of the sheet, indicating ropes hanging from the ceiling, from which a monkey dangles. Aoki thus plays on the illusoriness of the picture plane, whose dimensions and meaning can be easily changed with two slashing lines. Also reflecting the influence of animation, on which she works with the artist Zon Ito, this treatment of the drawn image indicates Aoki's increased interest in drawing as a vehicle of perception. The Animal Land series, also part of Gluesight, conveys hallucinatory perception as an almost physical affect. Plainly drawn animal figures are flatly laid out and juxtaposed in the blank pictorial plane. Suggesting the childlike copying of banal images, the Animal Land drawings reject perspective, with images suspended as individual elements. In this presentation of half-images waiting for a context, Aoki recapitulates the state of the waking mind as it withholds judgment but passively takes in random images. The perception of one's eye and mind as pure receptacles for images releases spectators from the narrow sense of "I" as consciousness, bringing them into more direct contact with the reality of the image. By accompanying wall installations of her drawings with animation pieces and small objects, Aoki has organized her exhibitions as a physical reconstruction of her drawing process, providing spectators with a vehicle to enact their fluid perceptions, responding to the effects of lines produced by different mediums. 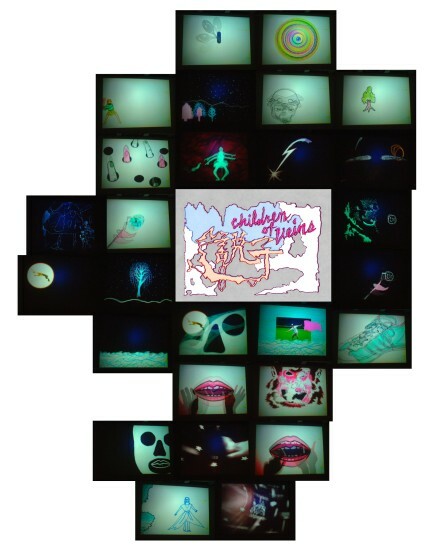 Her installation at the Hammer Museum combines a wall installation of drawings, Cross Sight Puzzle, and two animation pieces, Joints and Children of Veins. 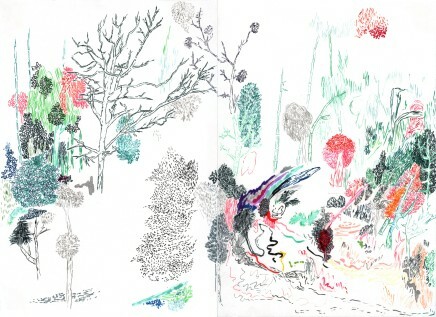 An accumulation of numerous drawings of woods, flowers, and landscapes, Cross Sight Puzzle integrates many of her familiar motifs and techniques. 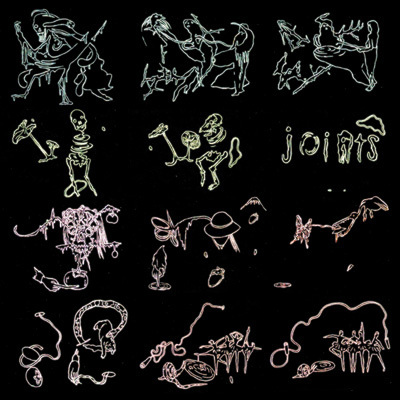 Analogous shapes are repeated from one drawing to another, with meandering paths corresponding to curving branches and dense chains of flowers juxtaposed with diffusely scattered animal figures. The combination of images recaptures the processes of displacement and condensation, rendering their temporal phases spatially as cross-referential parts of a composite picture. The movement of the eye across the picture field is reinforced by the partial coloring of the images, which evokes the emergence of figures in an animated film. In the animation pieces, the free association triggered by the addition of lines recapitulates the drawing process, projecting a vision of an elastic world in which things transform themselves through metonymical evocation. The entire installation is addressed to the mind that freely crosses the threshold between the imaginary and the real. Aoki's work thus embodies the capacity of drawing to serve as a map of the imagination, creating from modest, everyday materials a magical stage for the actualization of dreaming and perception as an enabling performance. 1. Sigmund Freud, The Interpretation of Dreams, trans. James Strachey, (London: Penguin, 1976), 155. 3. Gilles Deleuze, Essays Critical and Clinical, trans. Daniel D. Smith and Michael A. Greco (Minneapolis: University of Minnesota Press, 1997), 63. Midori Matsui is a Tokyo-based art critic who has written extensively on contemporary Japanese and American artists for exhibition catalogs and art magazines, including Parkett, Flash Art, and Artforum.